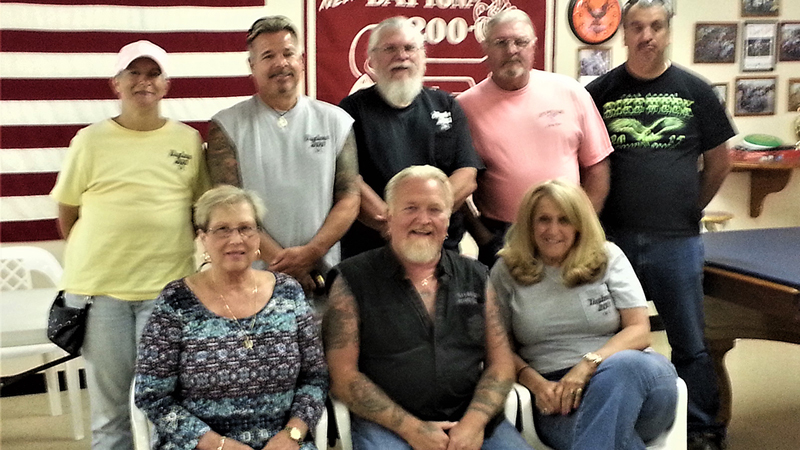 Founded in May, 1943, we are one of Florida's oldest established motorcycle clubs. The American Motorcyclist Association (AMA) has us chartered as number 421 in 1960, but a notice in the February 1947 AMA magazine says that the 'Daytona Beach Motorcycle Club' chartered with them that month. This early AMA number indicates that 1947 club was the first sign of what was to become the Daytona 200. We began life as a combination dirt bike AND road riding club. Riders from all over the world have come to Daytona to participate in our famous 'Alligator Enduro.' The enduro was founded in 1949, and while we ran it for over 20 years, the 'Alligator Road Tour' is now held in its place. The Road Tour is held every year during Bike Week. For over 35 years we have organized and hosted the famous 'Toys For Our Kids' charity run for this area. This event is held in mid November every year and brings in good money for "The Children's Home Society of Volusia, Flagler & Putnam Counties" the charity we currently support. This non-profit corporation deals with various types of children who fall through the governmental social net. We not only help the community, we also find time to have fun! We host dinner rides, charity poker runs and club socials. We also try to participate in the functions of other motorcycle organizations both local and abroad. Anyone interested in joining the club or just joining us for a ride, are invited and welcome to do so. Our Club motto is: 'We don't care what you ride; we just care that you ride.' We have every marque and all types of motorcycles. We welcome trikes, sportsbikes, touring bikes and customs. As long as you can keep up with our legal running speed. Our members are good, hard-working folk, from all walks of life and all age groups, but we all share one common interest...Motorcycling! Good, SAFE, FUN with motorcycles. Robin Henry-Trustee, John Beighey-President, John Pate-Vice President, Bill Gallant-Public Relations, Joe Reed-Sgt. at Arms. Linda Wright-Secretary, Rick Elder-Treasurer, Diane Gallant-Trustee, not shown-George Souza-Trustee. Come join us. We look forward to meeting you!